SINGAPORE - Singapore's economy performed much better than expected this year due mostly to a strong showing in electronics, prompting the Ministry of Trade and Industry (MTI) to upgrade its 2017 gross domestic product (GDP) forecast on Thursday morning (Nov 23). Full-year GDP growth is now expected to be 3 per cent to 3.5 per cent. This is up from an earlier estimate of 2 per cent to 3 per cent, with the final figure expected to come in at the upper end of the range previously. The Monetary Authority of Singapore (MAS) said that its forecasts for core and headline inflation remain unchanged. Therefore, its current neutral monetary policy stance announced in October 2017 remains the same, said MAS deputy managing director Jacqueline Loh. The upgraded forecast dovetails with Prime Minister Lee Hsien Loong's earlier remarks on Sunday that the Singapore economy could expand by more than 3 per cent in 2017. Some private-sector economists have also revised their estimates upwards, with three consecutive quarters of growth now in the bag. 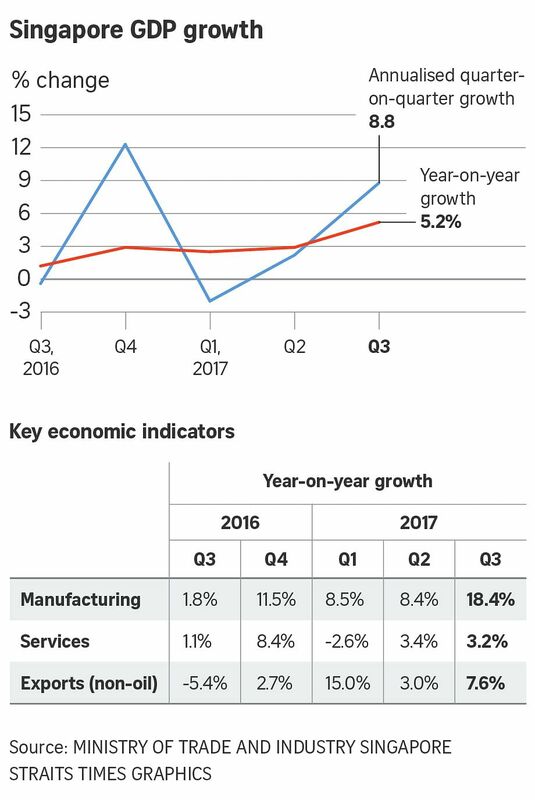 In the latest data released on Thursday, the Singapore economy grew by 5.2 per cent year on year in the third quarter, led once again by the manufacturing sector. This is faster than the preceding growth of 2.9 per cent in the previous quarter and the best showing since the economy grew 5.4 per cent in the fourth quarter of 2013. On a quarter-on-quarter seasonally adjusted basis, the economy expanded by a whopping 8.8 per cent, accelerating from 2.2 per cent in Q2. The headline figure of 5.2 per cent was revised upwards from October's advance GDP estimates of 4.6 per cent. This beat economist expectations of a 5 per cent expansion, according to a poll by Bloomberg. As for 2018, the Singapore economy is forecast to grow by 1.5 per cent to 3.5 per cent. The MTI said that the pace of growth is expected to moderate, compared with 2017, but "remain firm". The manufacturing sector is expected to continue to expand and provide support to overall GDP growth. However, growth in several of Singapore’s key external demand markets such as China and the eurozone is projected to ease. On the external front, global growth is expected to pick up marginally on the back of stronger economic growth in the US and some emerging markets and developing economies. Externally oriented sectors are expected to benefit from this global economic recovery.